…yes, that’s “desert”, not “dessert”! Well, I know you were all so very anxiously awaiting this post. I know that you were laying awake, staring at the ceiling, wondering “what in the heck did that little blogger make for the Fourth of July?” Did she go classic hamburgers & beer? Did she make cupcakes? What. Did. She. Make?? Well, my friends, the answer is, she made a completely self made recipe of bean, pepper, and and mushroom pizza squares. *Sounds weird, I know. And, because I am patriotic, not because I am obsessed with blueberries*, made a blueberry cheesecake. My sweet husband and I were graciously invited to my friend’s house, allowing us not only to eat and drink until we felt like napping, but to have a simply wonderful time out in the desert sunshine. Some of you may know my very dear friend, who blogs over at Sippy Cups and Prada. 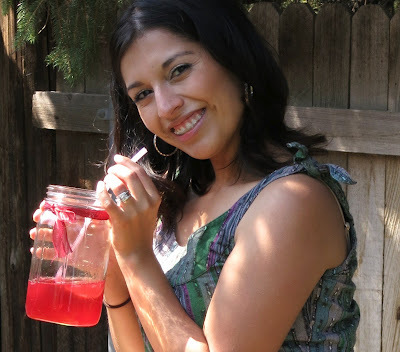 Her blog is growing in popularity, and is very inspiring, as the woman has two children, a husband, two dogs, and a very steady, meaningful job at my office. Needless to say, I’m impressed. And the important thing is that she looks good doing it! 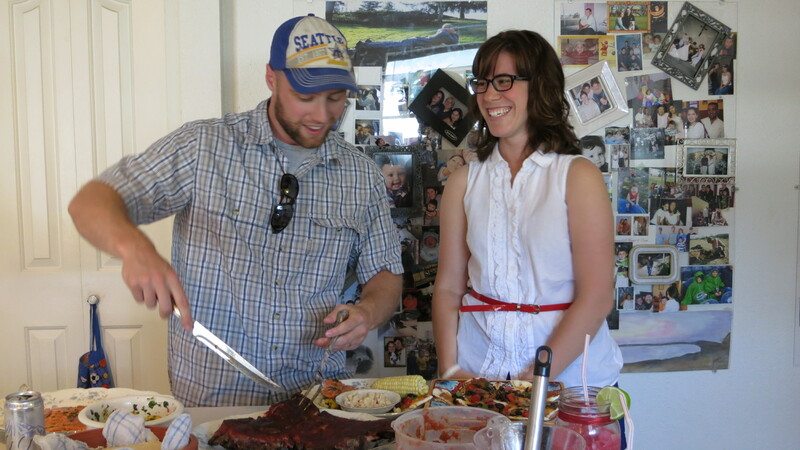 As for the barbeque, we had grilled salmon, ribs, deviled eggs, homemade tortillas (which she has blogged about, people! 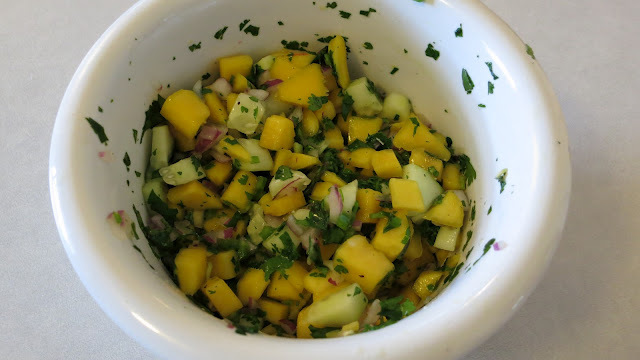 ), mango salsa, not to mention beer, and a very strong, slushy, pink drink, thaat apparently had a lot of champagne and sugar in it. 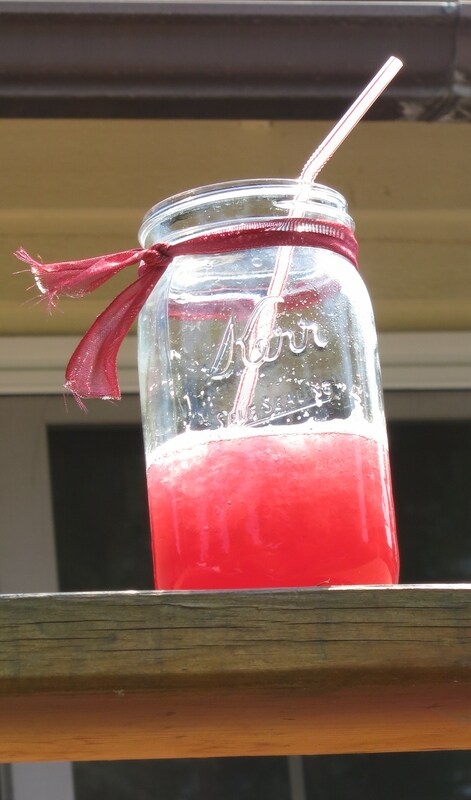 Oh yeah, and they were in mason jars, so obviously that makes everything a bit more trendy! On a sidenote, I am not sure if the husband, myself, and our pup, Molly may get invited back again, as Molly promptly “fell” into their pool, and caused quite a ruckus. She’s been known to cause a scene at barbeques before. 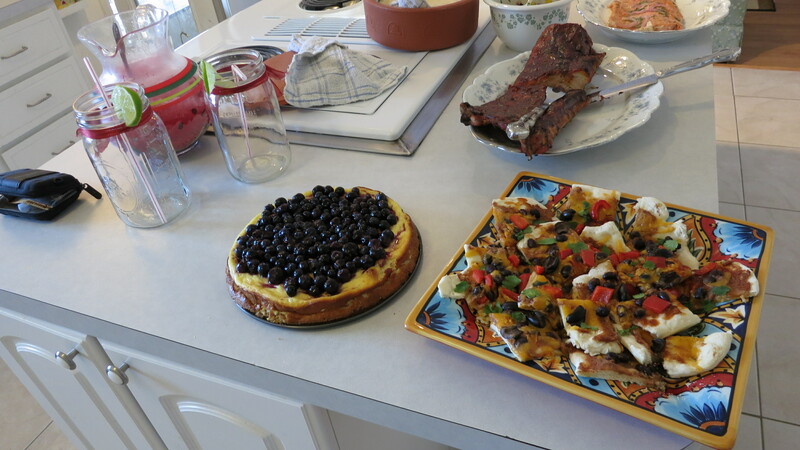 Anyways, on to the food; there’s my cheesecake and pizza squares on the right! 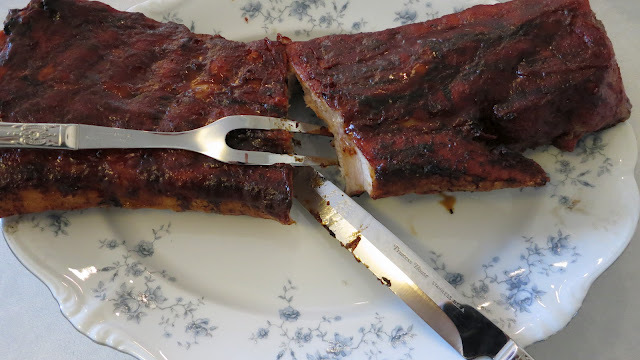 There’s Husband, slicing into the delicious ribs. He’s clearly being hilarious. Here we are, having a stimulating conversation! And, here are the slushies! Now, on to my pizza squares. 1 pre-made pizza crust dough, or home-made. I prefer whole wheat dough when cooking the dough on the pizza stone, it turns out nice and crispy. ½ c. finely chopped red, orange, or yellow pepper, but definitely not green, ick. Pre-heat oven to 375 degrees. The assembly of ingredients is just like a regular homemade pizza, however, I like to bake the raw dough on the pizza stone for about 5 minutes so that it won’t turn out mushy and fall apart in your hand, not that it’s happened to me! Spread the refried beans on the crust just as you would marinara sauce on a cheese pizza. Top with ½ the cheese and sprinkle with black beans, peppers, olives, and mushrooms. Bake for about 15-20 minutes, or until the crust turns golden at the edges. Let cool for about a minute and sprinkle with the cilantro. I think you will love this dish; it’s tasty, simple, and best of all, husband approved! I really like the writing, so expressive and detailed! This looks like a true feast, I bet all of you needed to take a nap afterwards. A happy day for sure. The cheesecake looks professional! Looks fun & tasty Kathleen – I want one of those slushies !